Fink's Happenings: Daisy Doodles Challenge-Valentine with color and shimmer! Daisy Doodles Challenge-Valentine with color and shimmer! First things first, the reason you came. 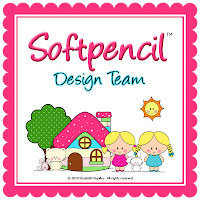 If you are visiting today it is to see what is going on at the wonderful blog of Daisy Doodles! There are awesome images available by Jules! They are cute and best part is they can be used for almost everything! If you check out the challenge 27 you will get be able to get the Valentine Sentiments free and it is what I used for my card this week! 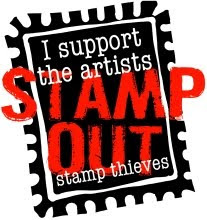 It is a great set of sentiments especially for free! What do you think? I would say that if you tried this technique not to use the foil paper (my red strip) since it makes easily!!! I also tried another technique which was to use the die and color around it. I waited until after the sentiment was cut so it did not work like it showed in the book but pretty close. I use red and left a white edge around it. Next time I will color around the die first with ink then cut it to give it a layered look but I like how this came out! The sentiment is actually on the inside of the card so you see it through the window. I then added the tied red bow and the heart to add an extra touch to the window. The sketch is one I saw at Paper Craft Planet with some changes! Supplies: Image, Paper: Martha Stewart & Kraft, Ribbon: $1 bin Target, Gems: Recollections and Heart: Dress it up! Thanks for stopping by! I will be coming up with some questions or polls for all of you regarding card making, challenges, and groups! Check back soon! As always please check out my team mates fantastic creations!!!!!! 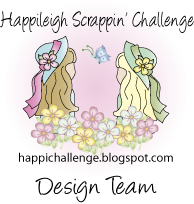 For the Happileigh Scrappin challenge please check the last weeks post as we are continuing that weeks challenge! Looks great to me! So very pretty.